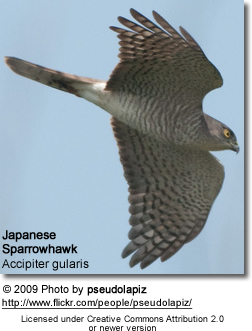 The Japanese Sparrowhawk (Accipiter gularis) is a bird of prey in the family Accipitridae which also includes many other diurnal raptors such as eagles, buzzards and harriers. It breeds in China, Japan, Korea and Siberia; winters in Indonesia and Philippines, passing through the rest of South-east Asia. It is a bird of open and wooded areas. It is 23-30cm in length, with the female larger than the male. 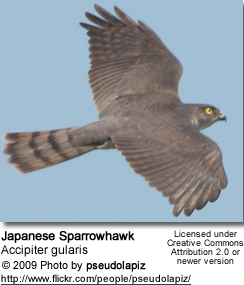 The male has dark barred underwings, lightly barred underparts, dark grey upperparts and red eyes. 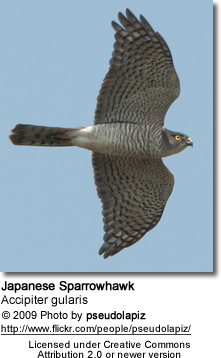 Female has yellow eyes and dark barred underparts. 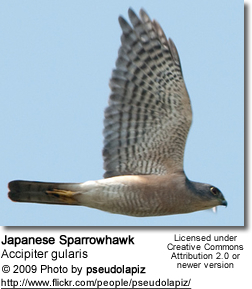 Juvenile has brown upperparts and streaks on breast.